Main Engine: Sulzer 7RTA84C 2-stroke diesel engine. 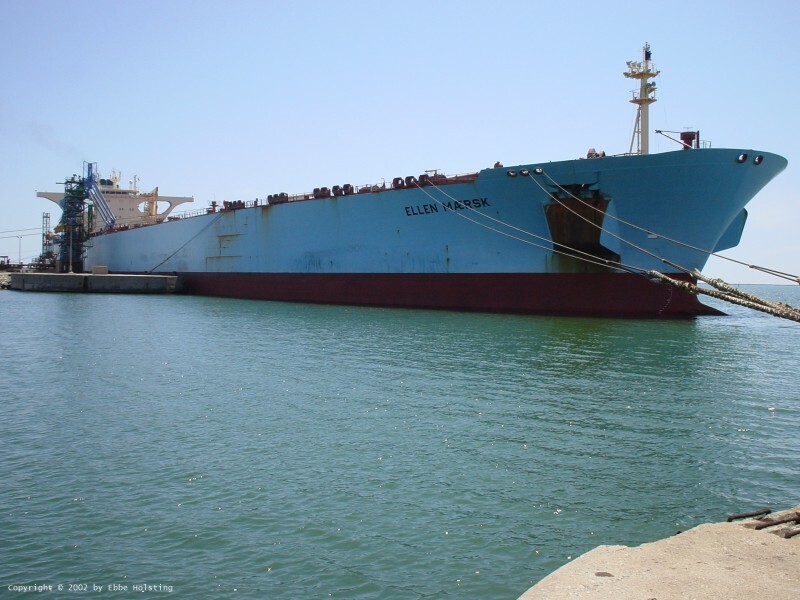 UPDATE December 2008 The ship was converted to an FPSO in Korea during 2008. 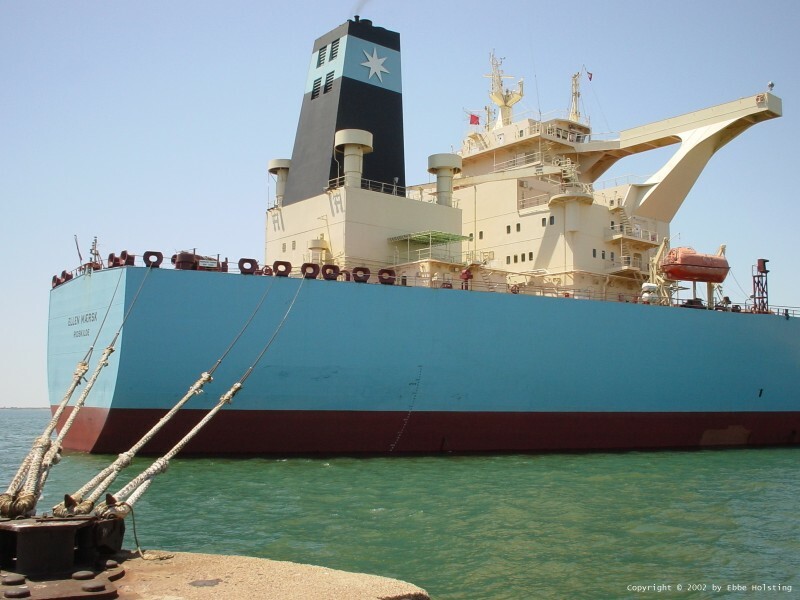 She is now deployed at the Vincent Oil Fields off Australia under her new name "Maersk Ngujima-Yin". 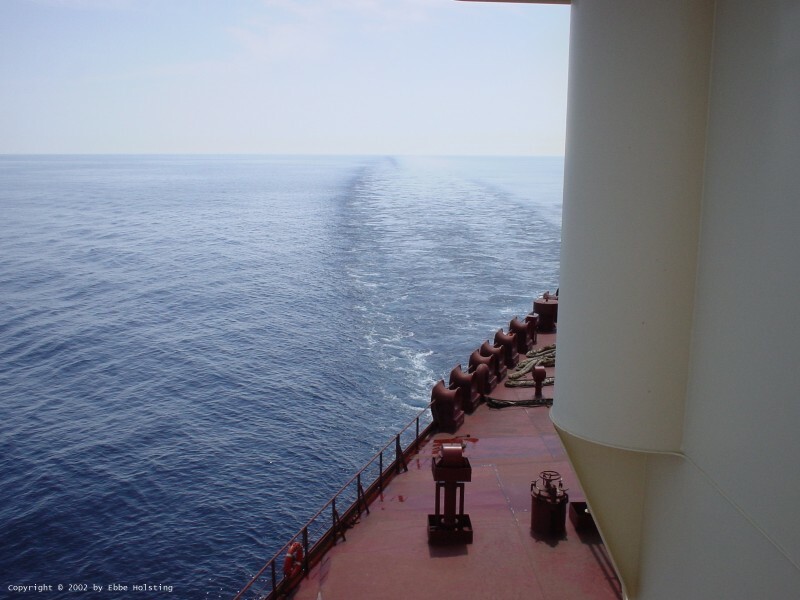 Drifting along at low speed in the Persian Gulf off the coast of Saudi Arabia. Air temperature was close to 40 degrees celsius (104 Fahrenheit). The yellow lines on deck mark a 'Safe Passage' meant to guide people from ashore safely to the acommodation. 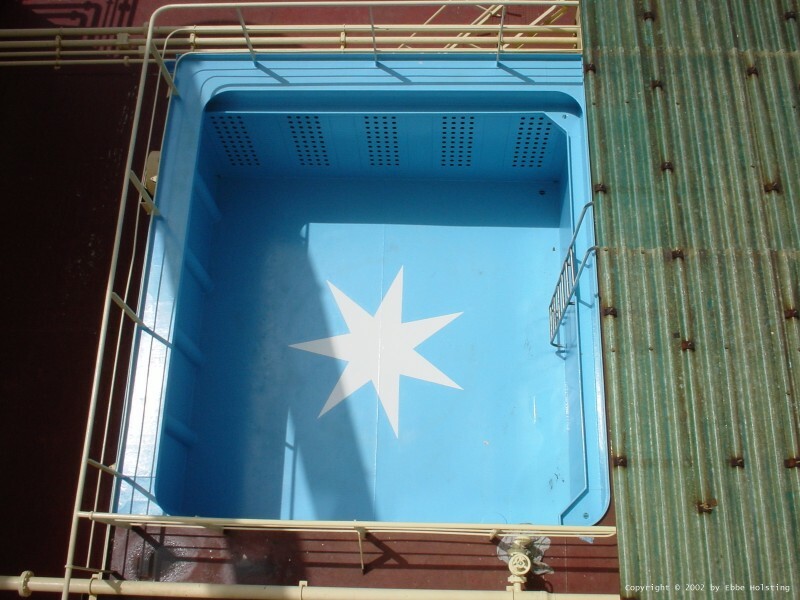 The ship's cargo tanks are located directly below the deck. Sailing in the Persian Gulf we came across this piece of very(!) calm water. 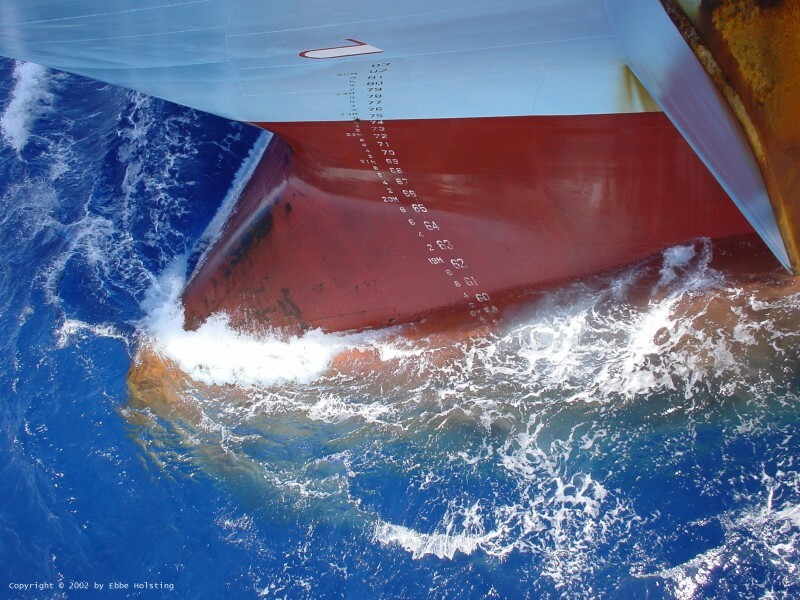 The big thing under the water is the ship's bulbous bow i.e. the giant under water "ball" on the bow of a ship. The bolbous bow improves the ship's aqua dynamics giving it less water resistance. Less calm water yet still calm. A look at the bow and bulbous bow. The numbers on the side of the bow indicate the draft which in this situation is 19 meters (62 feet). 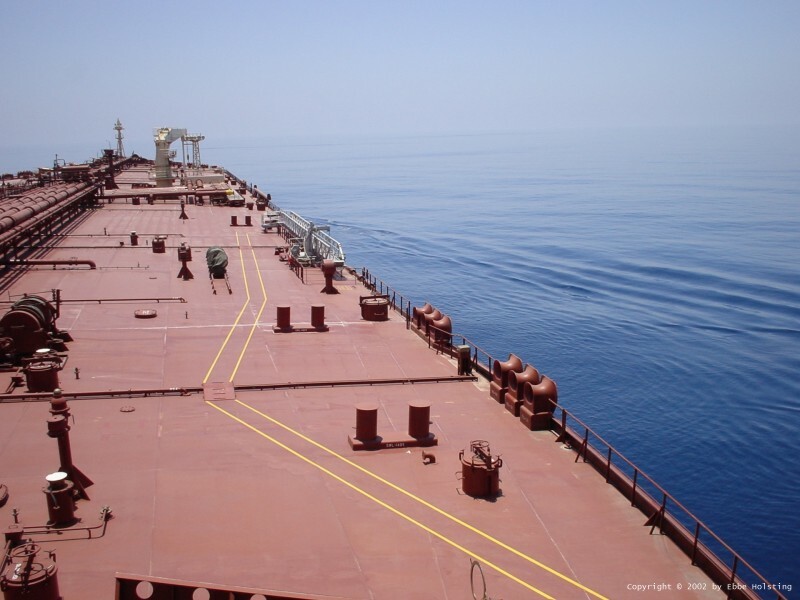 We were in a partly loaded condition at the time, en route to Ras Tanurah for further loading. A look over the enormous weather deck on Ellen Maersk looking from the navigation bridge. 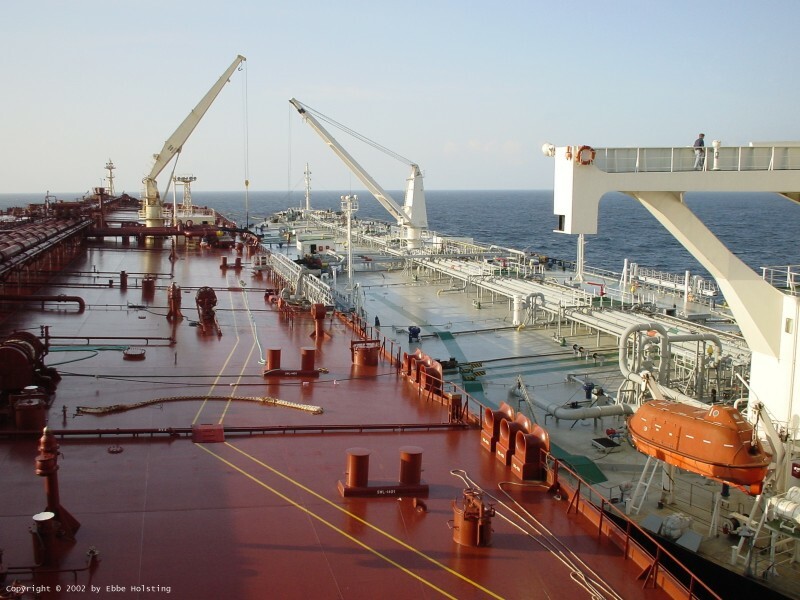 The crane is operating the hoses for cargo operations which was commenced later the same day. 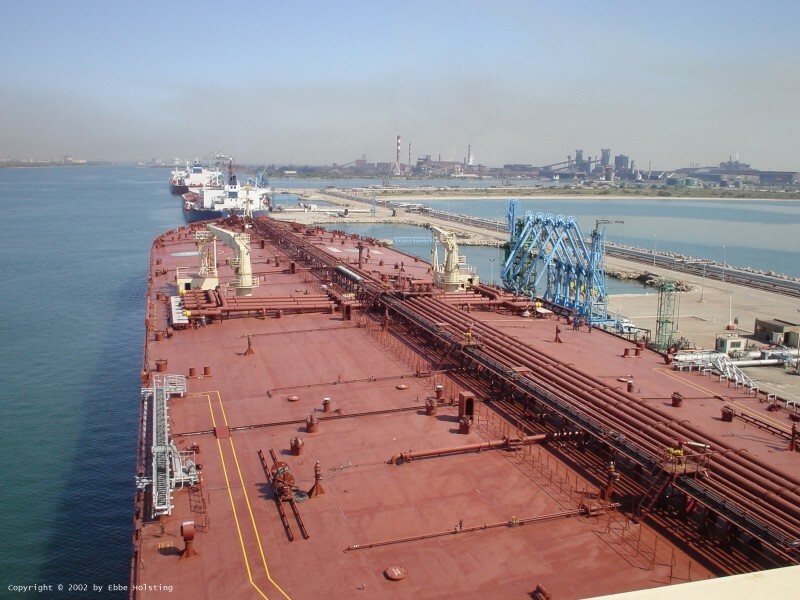 The 3 biggest pipes in the midships pipe section are the 3 main cargo lines. 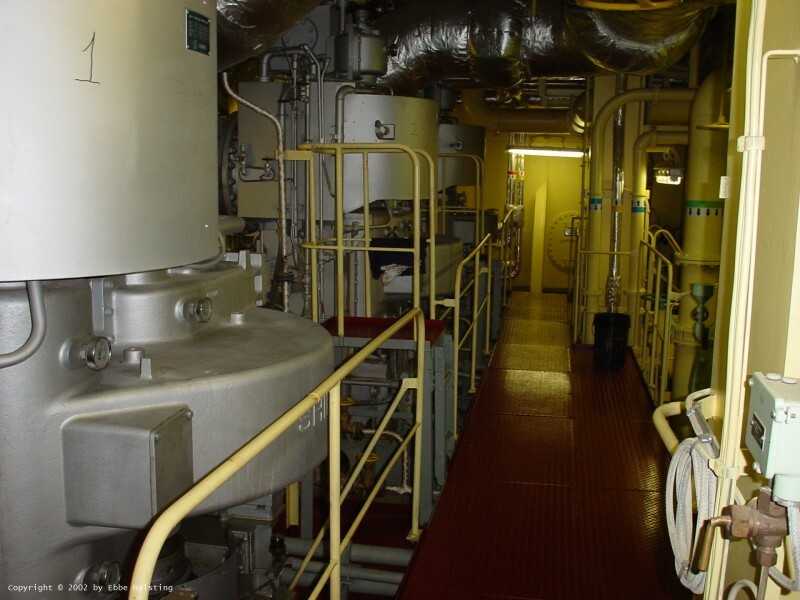 The ship is fitted with 3 seperate pump / piping systems. 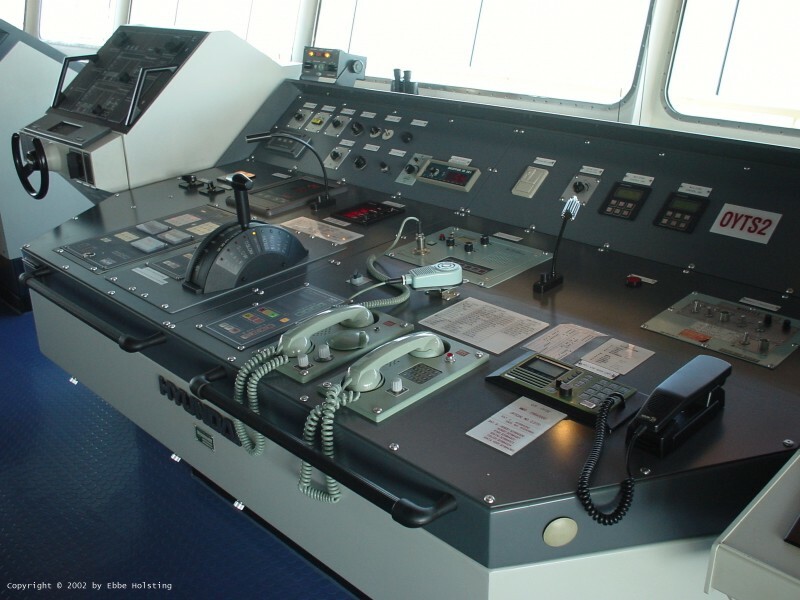 The navigational bridge of Ellen Maersk. The chart table in the foreground is used for route planning, i.e. planning of a future route to be travelled. 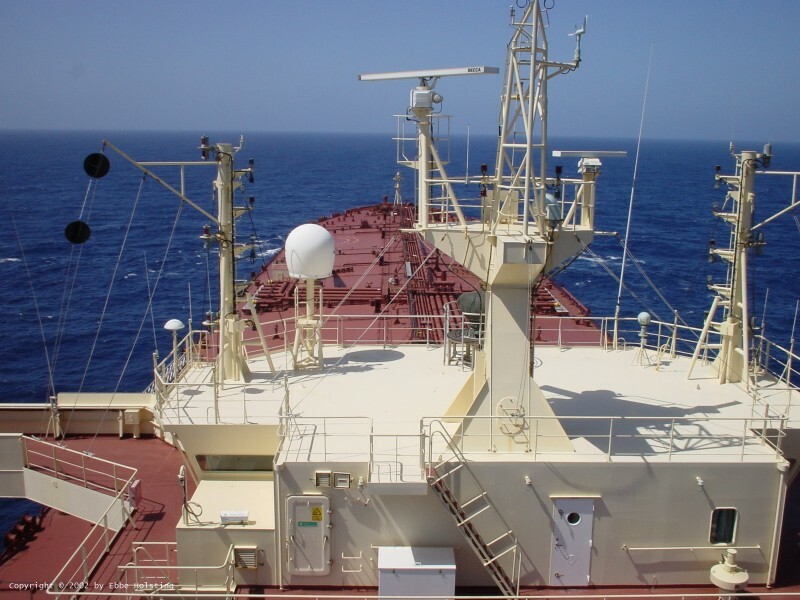 Route planning is typically a bit tricky on tanker vessels, since they, unlike e.g. container vessels, are not enganged in a specific schedule. The port of destination might change several times during the voyage! Another look at the bridge, here at the main control panel. The stick a little to the left of the middle is the engine telegraph where the main engine is controlled from the bridge. The black 'telephone' to the right is the VHF radio used to communicate with other ships, shore stations, harbours etc. 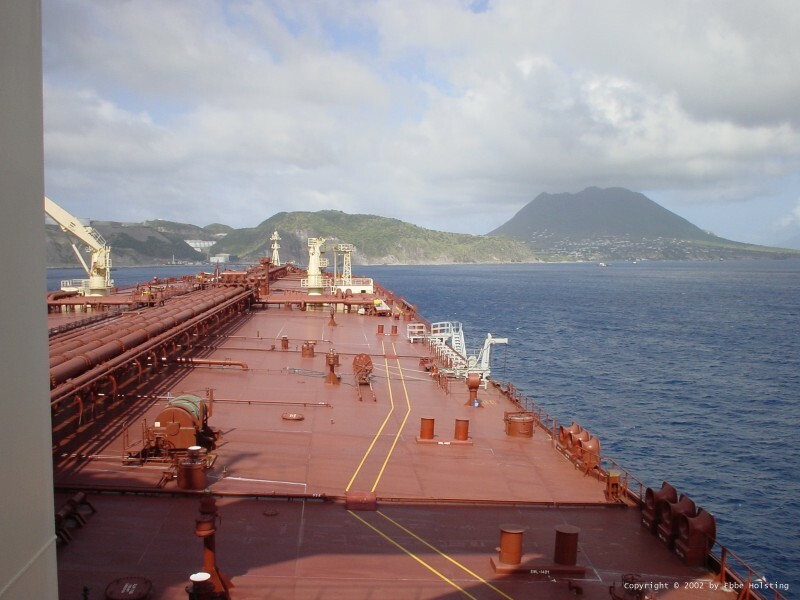 Anchored at the carribean island St. Eustacius for bunkering (refueling). Quite a large vulcano seen to the right! We were en route to Galveston, Texas for unloading. At a monthly fire drill we tried one of the foam monitors (cannons) on deck. It made the deck look like a snowy landscape for an hour or so. 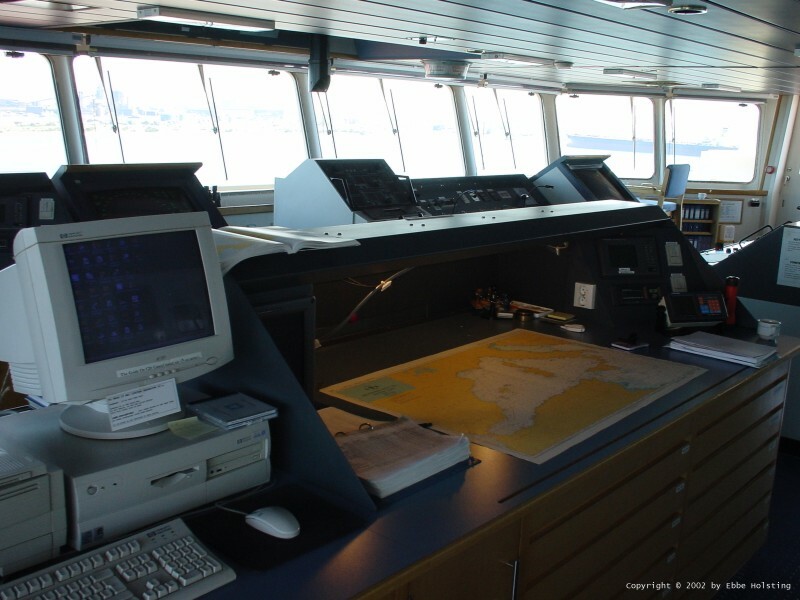 The ship is equipped with enough monitors to cover every square inch of the deck with foam. The foam is much like soap, so the ship was all nice and clean afterwards. Looking downwards from the very top of the funnel. My fellow cadet Klaus is standing next to the railing in the upper part of the picture. The two big yellow round things are air intakes for the engine room ventilation system. Still in the top of the funnel, now looking ahead. The two black balls to the left indicate that we are "Not under Command" due to the fact that we had engine problems at the time this picture was taken. Nothing serious though. The entire wheelhouse is visible here, with it's mass of masts and navigational lights. The two radar scanners are also visible. Sailing at full speed (17 knots) in the Atlantic Ocean. Picture taken from the starboard bridge wing. The green thing resting og two rails in the middle of the picture is the drum containing the pilot ladder. This ladder can be extended over the side when embarking / disembarking a pilot. A look back the way we came. Still in the Atlantic. 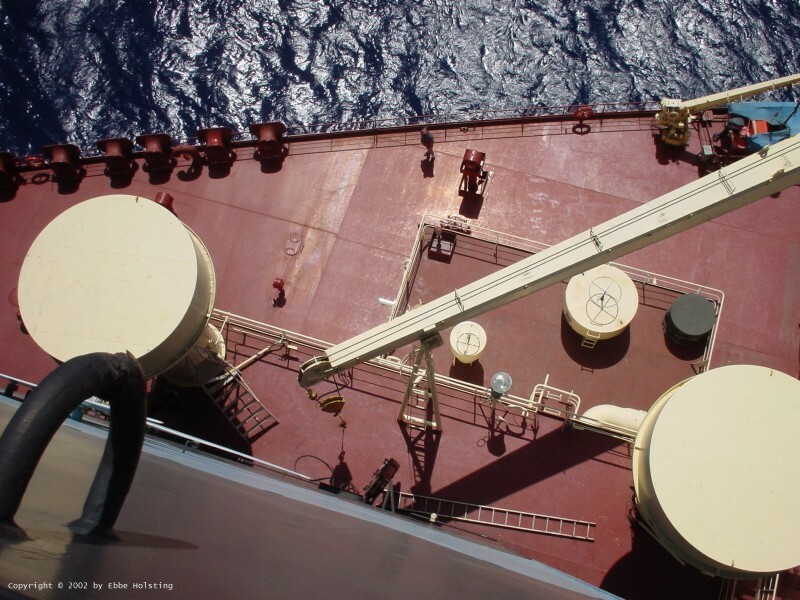 On tanker vessels the superstructure (accommodation) is typically placed all the way aft, since the view ahead is not blocked by for instance containers. Looking aftwards from the bow of the ship. The pipes on the over head railing include water for fire extinguishing and an oil line for Crude Oil Washing (used for flushing the tanks). 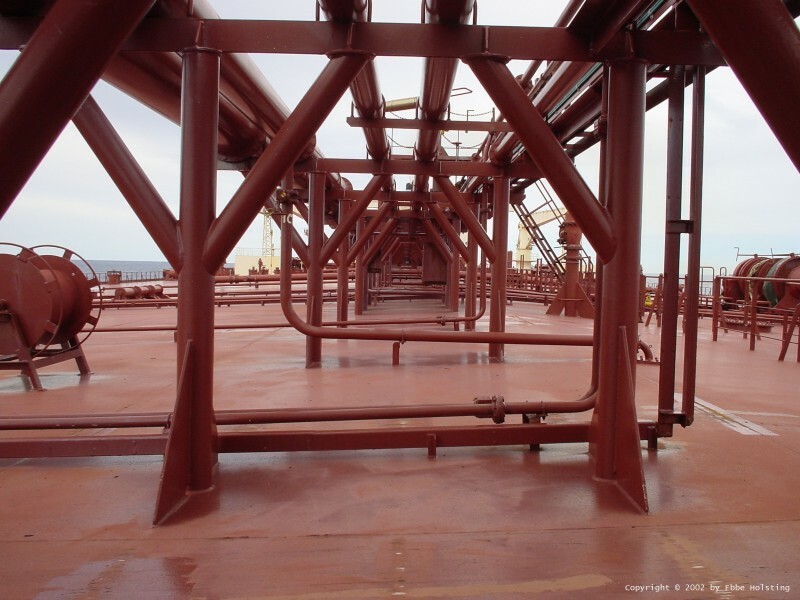 At about midships this tube railing also carries the 3 main cargo lines for loading and discharging. 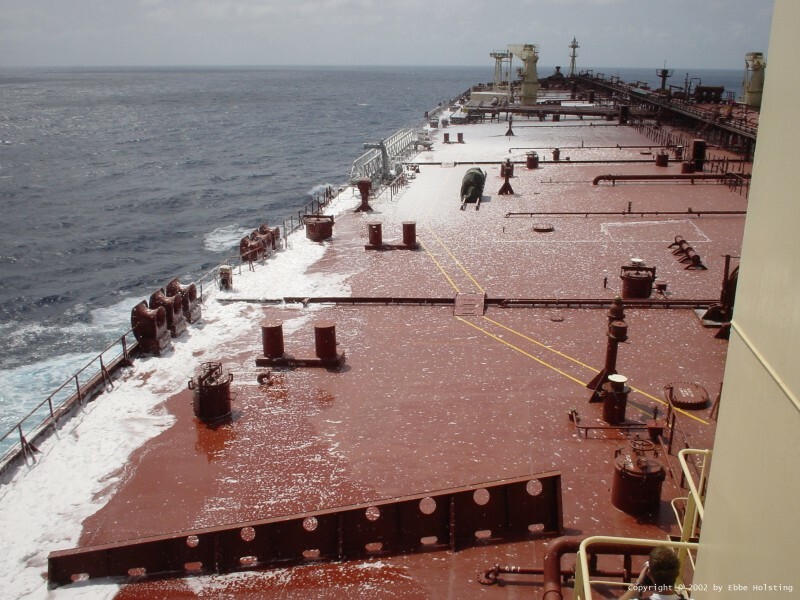 Here we are discharging to a smaller tanker in the Mexican Gulf. 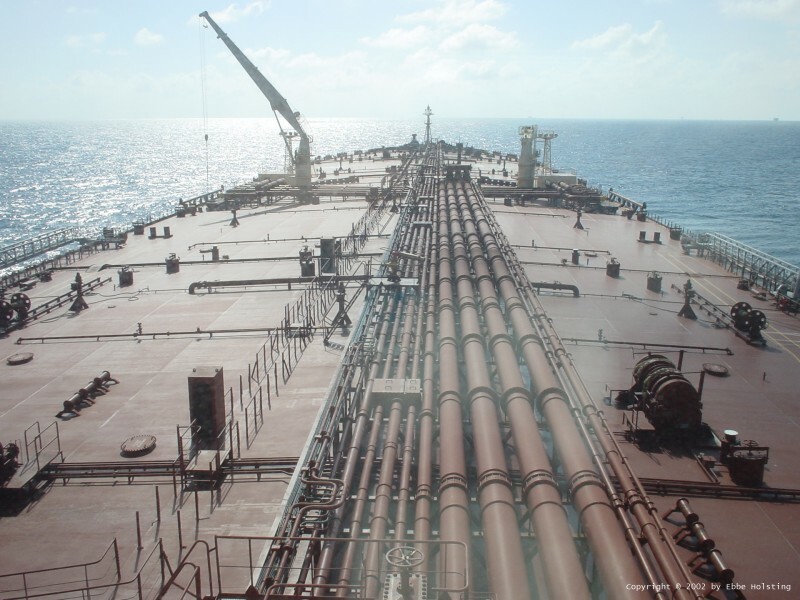 The smaller tanker will then transport the oil to Loop and Galveston, USA as Ellen Maersk was too large to go any closer to the coast. (We couldn't even see land from the ship). As we disharged the ship's draft naturally decreased, and meanwhile the draft of the smaller ship increased, so this funny situation occured near the end of the operation. 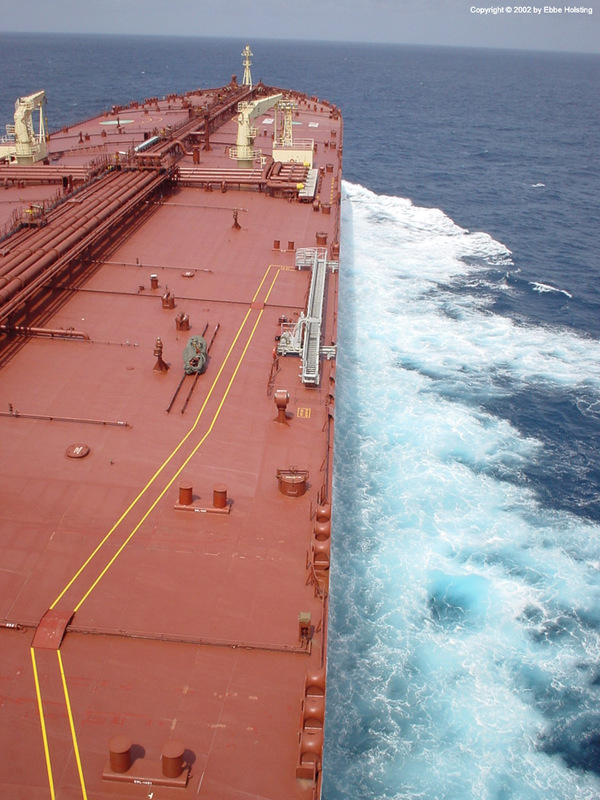 You could almost touch the bridge wing of the smaller tanker. Together with a fellow cadet I repainted the swimming pool and took the liberty of decorating it with the company logo: the white star with 7 "arms". 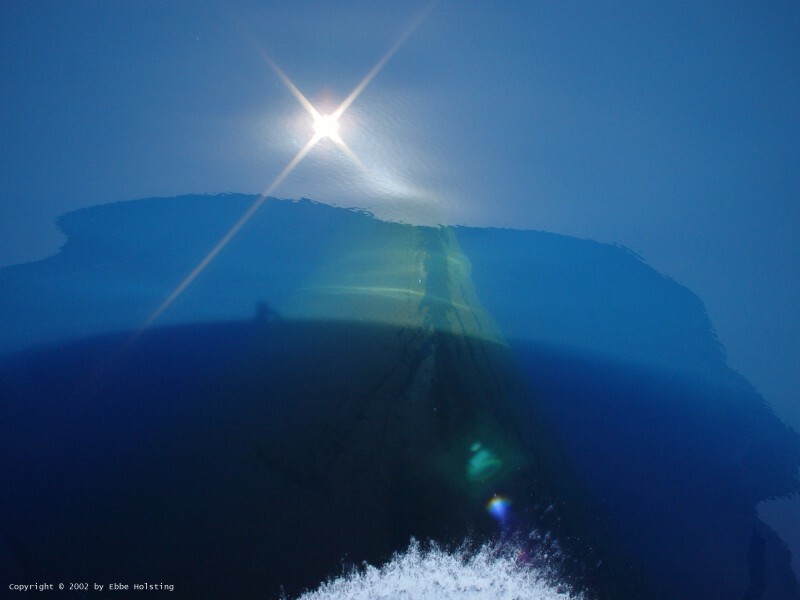 The picture was later published in the company's news magazine "Maersk Post". After crossing the Atlantic Ocean again we berthed at Fos sur Mer in France. This picture is taken from the port (left) bridge wing. The blue things connected to the ship's manifold are called Chicksan Arms through which the cargo is being discharged. Here I am standing in front of the cargo manifold and the chicksan arms. The chicksan arms are equpped with flexible joints, allowing them follow the ship's movements up and down during tides and draft changes. The round thing with a hatch on top a little to the right of me is an entrance to one of the many water ballast tanks. For the first time in three months I touched earthly soil, here taking a walk on the pier at Fos sur Mer providing me with a chance to fotograph the ship from ashore. 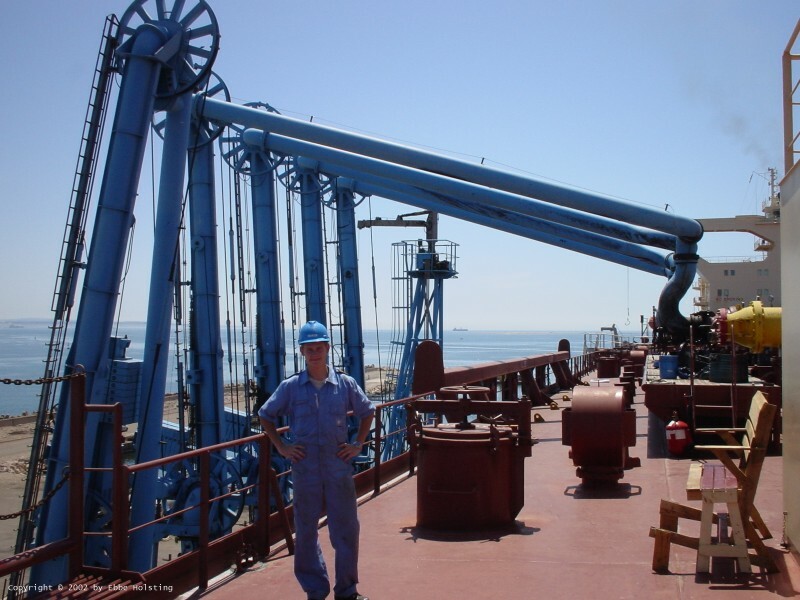 The ropes holding the ship in place are actually steel wires, since they are less flexible thus fixating the ship stronger than is possible with traditional mooring ropes. The strict fixing is important due to the chicksan arms, as they cannot take too much movement back and forth. At the very tip of the mooring lines we see short pieces of rope. These add a little bit of flexibility. So here it is. A full-view of the Ellen Maersk berthed at Fos sur Mer. It is difficult to to determine her real-life size in this picture however. Super tankers are truly giants of the sea! Finally a little peak inside the engine room with the main engine in the bottom of the picture (only 5 of the 7 cylinders are visible). A spare piston to the right alongside a spare cylinder liner. The grey structure in the upper right hand corner is one of the main boilers for steam production. Steam is used for powering the turbines for the cargo oil pumps. These 3 steam turbines powered the 3 cargo pumps with 2700 kW each and gave them a capacity of 5000 cubic meters per hour. 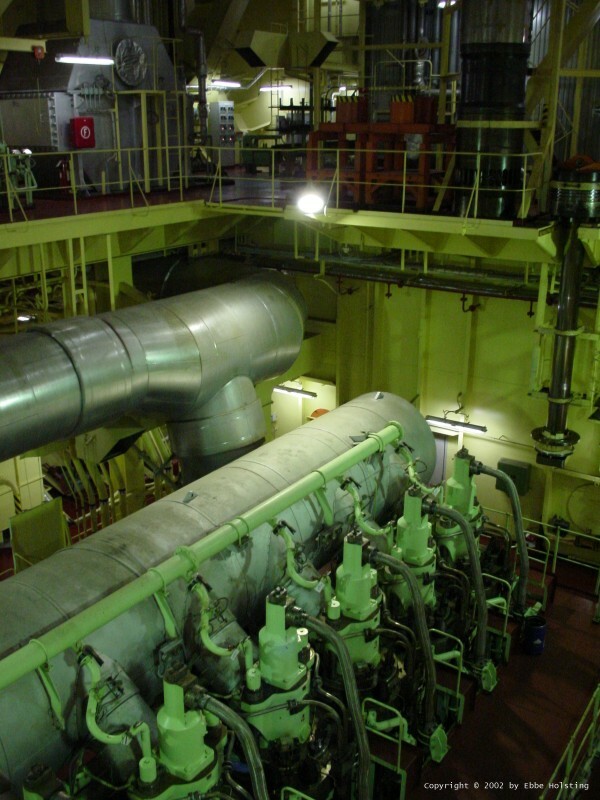 In comparison, an auxiliary engine on Clifford Maersk produced 3000 kW! The cargo pumps were only used when disharging, since shore pumps were used when loading.